I perform Hindu wedding ceremonies according to our Vedic scriptures and provide an explanation in English to the couple as well as the audience. During the wedding ceremony I make a humble request that everyone maintains silent. I offer help and support to the couple by providing a list for items required for the vidhi (pre-wedding ceremony) and wedding. 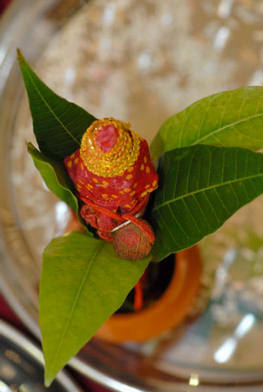 I can save them the time and trouble by supplying the Puja items at a cost. I provide a template of brief explanation of the wedding ceremony in English for you to copy and then to distribute it to all the guests on the wedding day. I endeavor to create a special day in the couples’ lives that is remembered by all the relations and guests attending for a very long time. I hold two meetings with the Bride & Groom and their respective families at my house. One of the meetings can be closer to brides home if it is possible. There is also an option of a rehearsal for the couple if they wish to have it. Within the ceremony, I try and bring awareness of Hindu spiritual teachings to all present. The ceremony is performed and managed, in a disciplined and timely manner, with a professional yet dynamic approach. I can explain the ceremony to young and old guests in English, Gujarati and Hindi. The wedding ceremony takes approximately 90 minutes. The cost for all the wedding ceremony is standard however the cost for the transport may vary depending on where the ceremony is being held. Whilst having the ability to maintain crowd control, I ensure the ceremony remains enjoyable. I can recommend a team of coordinators to ensure smooth running on the day and a team of musicians who provide harmonic background music and songs related to the wedding. There is an extra cost for the Ganesh Puja, Mandvo, Pithi, Janoi and/or GrahShanti Vidhi. This cost depends on if the ceremony is held on the same day as the wedding or previous day of the wedding ceremony. If the client agrees with the arrangements then they reply by filling in the booking form on the website and paying a deposit before I can confirm the wedding date.